Knit, Lola, Knit: Knit? I knit? What's knitting, I think I'm starting to forget exactly how to do this thing they call knitting. It seems so long since I've actually done any. I was busy with this last week and then had a wedding to go to all day Saturday. What with Christmas shopping and reading some great books I've been engrossed in I've been slacking in this department. If I want some knitting gifts I'm really going to have to get cracking! Maybe the reason I've laid the needles down this week is because of the frustration the Anthropology shrug is giving me. Somehow I got of on my increases again (you'd think I knew how to do this by now) and had to frog back a couple rows. This took longer than the messed up rows had taken to knit, so I made absolutely no progress during the space of an hour and a half. I think it took it's toll on my knitting confidence. 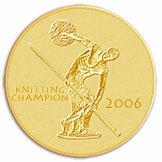 Wendy was just saying that knitting takes courage, and I believe her, let me tell you. I did have the courage to pick up the needles a bit on Sunday and taught myself how to knit the "continental" way. I still throw the yarn for purling (haven't quite mastered that one), but I like how fast continental knitting actually goes. I think I've figured out the secret to those fast knitters who just whip stuff out, like Eunny. Now if I could just make myself find the time, I could have a finished object a week! 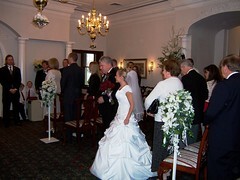 Well, since there's no knitting news, I'll share some pictures of the beautiful wedding I attended this weekend. Can you believe the whole thing was planned in just over a month? 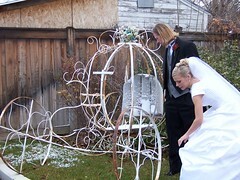 It was in a beautiful Victorian home, that even had a Cinderella carriage! Very romantic. 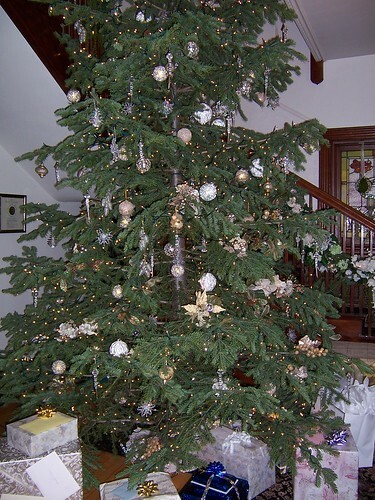 A beautiful two-story tree graced the entrance hall. Pictures with the Cinderella Carriage. She looked like a Princess too. 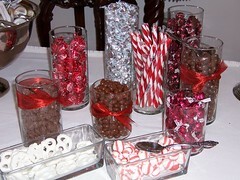 A candy bar was at the end of the buffet. Such a good idea! 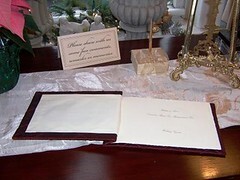 The Guest Book displayed in the entrance. 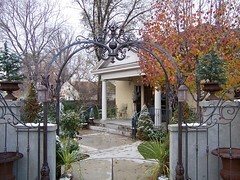 The garden outside the house. 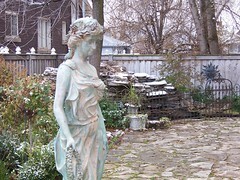 There was a statue and a waterfall in the garden as well. This would be beautiful in the summer. Congratulations to Kirsten and Aaron!